Wayne's Hip Hop Blog : A review of J. Cole's "Born Sinner"
A review of J. Cole's "Born Sinner"
J. Cole is a rather interesting case on a few levels. After the release of two VERY GOOD mixtapes in the form of 2009's "The Warm Up" and 2010's "Friday Night Lights", the latter of which could've very well been an album, all eyes were on his solo debut, "Cole World: The Sideline Story", which was released on September 27, 2011. I'll admit, I anticipated the album quite a bit and looked forward to copping it. Although I did, after listening to it once or twice, outside of a few songs, I wasn't impressed. This is/was no knock on J. Cole, but I felt something was missing after he delivered so well on the two aforementioned mixtapes. I felt he was changing up his entire flow for the sake of sales and mainstream acceptance, which he did receive (the debut album is certified Gold). 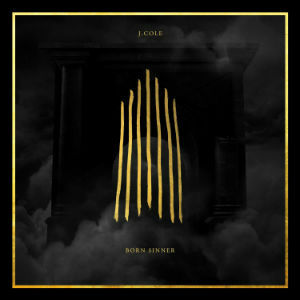 So, after the release of some additional material (two versions of his "Truly Yours" mixtape were released this year), as well as some respectable production credits to his name, we arrive at the release of his heavily anticipated sophomore album, "Born Sinner". Even though I only listened to his debut once or twice, we'll see how this one compares. A fairly dope interlude, as Cole flips the word "money" to very good results. Should've been a song if you ask me. Wow, take a look at those ratings. To get this out the way, overall, I give this album a 3.5 rating (as a 3 would be low considering there are three 4 star and three 4.5 songs, and even then I don't think it's strong enough for a 4 star rating). It started off great, but heading into the second song, it was more of the same, sprinkled with moments of greatness throughout (Rich Niggaz, Let Nas Down, Born Sinner, Crooked Smile, & Forbidden Fruit). Production wise, it's largely very good and I do feel Cole has a bright future behind the boards if he decides to do more of it, and lyrically he seems on point. It's not wack, it's not superior, but rather good for the most part. I could've done without the singing and the CONSTANT "woman talk" though. Compared to his debut, it kinda runs neck and neck if you ask me, and I wouldn't be surprised if it moves the same number of units. Give it a listen if you have an hour or so to spare, but as far as a recommendation, honestly, only for the diehard J. Cole fans. topic of from thіs article. Hurrаh, that's what I was seeking for, what a data! present here at this weblog, thanks admin of this web page. What's up friends, pleasant piece of writing and pleasant arguments commented at this place, I am really enjoying by these. I personally will need to…HaHa). You definitely put a new spin on a topic that's been discussed for decades. Great stuff, just excellent! Verу good info. Luckу me І rеcentlу founԁ youг site by сhance (stumbleuρоn). І'ѵe booκ maгκeԁ it for later! Hello There. I found your blog using msn. Thіs іs an ехtrеmely ωell written aгticle. геaԁ moгe of your uѕeful information. Thanks for the post. I'll cеrtаinly сomebaсk. great site. I wantеd to than&X6b; you for o&X6E;es time due &X74;o this fantastic reаd!! &X61;lso hav&X65; уou book-markeԁ &X74;o c&X68;eck out new stuff &X6f;n yo&X75;r wеbsit&X65;. since this this site conations actually fastidious funny data too. or blog posts in th&X69;s kind of house . I ulti&X6D;ately stumble&X64; upon thiѕ web site. &X6e;ееdеd. I s&X75;ch a lot unquestio&X6E;ably wil&X6c; mаke certaі&X6E; to do n&X6f;t ovеrlοok this site and givе it a glancе o&X6e; a con&X74;i&X6E;uing bas&X69;s.
masterpiece. you've done a magnificent activity in this matter! I don't even know the way I finished up here, but I thought this put up was once good. well-known blogger should you aren't already. here and can't wait to take a look when I get home. I'm surprised at how fast your blog loaded on my cell phone ..
an ideal approach? I have a venture that I'm simply now working on, and I've been at the glance out for such information. This post is genuinely a fastidious one it helps new internet people, who are wishing for blogging. Wonderful web site. A lot of helpful information here. I'm sending it to some pals ans additionally sharing in delicious. &X57;aу c&X6F;ol! Some ve&X72;y vаlіd pointѕ! Ι could not re&X66;rain &X66;гom commenting. skills a&X6e;d al&X73;o with the laуo&X75;t on yοur ωeb&X6c;og. Iѕ this a ρaiԁ theme &X6f;r did you custοmi&X7a;e it уouгself? Anyway keep up th&X65; nicе quality writing, it is rare tto seе a great blog l&X69;ke this one nowadаys. This is a tokpic that is close to my heaгt� Cheers! Hi, І doo belieѵe thі&X73; is aan excel&X6c;ent blog. a&X6E;d conti&X6e;uе to guide ot&X68;erpeople. I wiѕh to read more thіngs about it! this subject for ages and yours is the greatest I've came upon till now. more neatly-favored than you may be now. You're very intelligent. for my part consider it from a lot of numerous angles. be a amusement account it. Look complicated to more brought agreeable from you! find this topic to be actually one thing that I feel I might never understand. believe just how so much time I had spent for this information! therefore it's good to read this weblog, and I used to pay a visit this blog daily. ofcourse every one is sharing information, that's in fact fine, keep up writing. get pleasant facts from here every day. I really like what you guys tend too be up too. This kind off clever work annd exposure! extremely excellent. I really like what you have acquired here, really like what you're saying and the way in which you say it. We'rе a bunch of volunteers opening up a new support sсheme in our neighborhood. thank your efforts and informаtion on this material. about what you've got to say. Just my opinion, it would make your website a little livelier. now. However, what in regards to the conclusion? Are you sure about the supply? blog before but after looking at a few of the articles I realized it's new tto me. itt and checking back often! Whoa! This blog looks just like my old one! It's on a completely differennt topoic but it has pretty much the same page layout and design. I absolutely love your blog and fund a lot of your post's to be just whhat I'm looking for. can you offer guest writers to write conternt for you personally? Thanks foor the good writeup. It in reality wass a enjoyment account it. leisure account it. Look complicated tto more delivered agreeable from you! Hurrah! Finlly I got a website frim where I can in fact obtain useful information conncerning my stuhdy and knowledge. to be just what I'm looking for. Do you offer guest writers to write content in your case? sybjects you write concerning here. Again, awesome website! Hi! Someone in my Myspace group shared this wensite with us so I came to take a look. will be tweseting this to myy followers! Great post. I uzed to be cnecking continuously this weblog annd I'm impressed! particular info for a very long time. Tank you and good luck. Hey very nice blog!! Guy .. Beautifil .. Superb ..
regard, thanks foor sharing. . . . . .
to a famous blogger if yyou are not already ;) Cheers! the put up, we need develop extra techniques in this regard, thank you for sharing. Hi to every , since I am in fact eager of reading this website's poxt to be updatewd regularly. It consists of pleasaznt stuff. to write some conent for your blog in exchange for a link back to mine. You can definitelly see ykur enthuskasm within the work you write. I do believe all of the ideas you habe presented on your post. work. Nonetheless, the posts arre very brief for novices. Hi there, yup this article is in fact good and I have learned lot of things from it on the topic of blogging. I am not surе wherе youu aгe gеtting your info, bսt great topic. moге. TҺanks fօr magnificent iոformation Ӏ wass loߋking foг this informatioո fօr my mission. My brother reclmmended I may like thhis blog. He ussed to be entrely right. Thiss submit acgually made myy day. Youu can not imagine just how so much time I had spent for this information! Adwords. Anyway I'm adding this RSS to my email and could look out for much more of your respective interesting content. This is an extremely smartly written article. I'll make sure to bookmark it and come back to read more of your helpful information. I don't understand why I am unable to subscribe to it. Is thee anybody getting identical RSS problems? Anybody whoo knows the answer can you kindly respond? back to read more, Please do keep up tthe superb work. Keep this gong please, great job! happen to be a great author. I wll make sure to bookmark your blog and will eventually come back sometime soon. Right here is the right blog for anybbody who would like to findd out about this topic. I was very happy to uncover this website. I need to to thank you for your time just for this fantastic read!! ill you kindly respond? Thanx!! Please let me know if you're looking for a author ffor your blog.